Friday April 25th 1884. We went out to West End and spent the entire day it is a very pleasant place on the lake with all the conveniences found at such a place. It was dinner time when we came in and we walked about a little in the evening and went to bed early. The cold wind has gone down and it is getting warmer. Saturday April 26th 1884. We visited the armory this morning and were very kindly shown through by the gentleman in charge from there we went to Spanish Fort and were gone till late in the afternoon. I did not like that place as well as where we were yesterday. We were much disappointed to not hear from home, took a short walk after dinner and went to bed early. 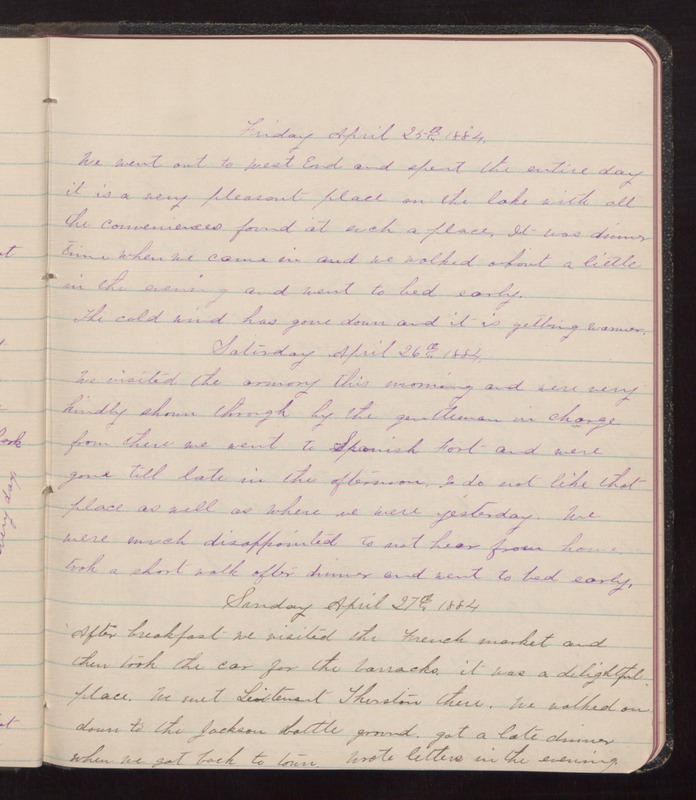 Sunday April 27th 1884 After breakfast we visited the French market and then took the car for the barracks, it was a delightful place. We met Lieutenant Thurston there. We walked on down to the Jackson battle ground, got a late dinner when we got back to town. Wrote letters in the evening.